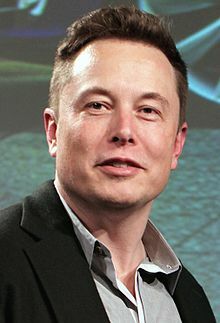 Is fiontraí, fear gnó, innealtóir, agus aireagóir é Elon Reeve Musk, a rugadh in Pretoria, san Afraic Theas ar 28 Meitheamh 1971). Aithnítear é mar chomhbhunaitheoir PayPal, SpaceX, Tesla Motors agus Solar City. Stiúrthóir ginearálta ar SpaceX agus Tesla Motors é faoi láthair, agus uachtarán ar SolarCity chomh maith. Tá cáil air as an Tesla Roadster a chruthú, arbh é an chéad ghluaisteán leictreach inmharthana na linne seo, as leagan príobháideach den tointeálaí spáis (an F9/Dragon) a dhearadh agus as an gcóras íoctha ar líne is mó ar domhan, PayPal, a chruthú. Tugadh an leathanach seo cothrom le dáta an 4 Deireadh Fómhair 2018 ag 18:10.